None. Dahlia foliage is killed by frost, and roots are hardy only to about 15F (-9C). Topdress with rich compost in early summer, after new growth appears. Fertilize with a liquid fertilizer in midsummer to support strong re-blooming. Mint, Thyme, Cilantro, Rosemary, Geranium, Gladiolus and Echinacea. The bushy plants will crowd any close neighbors. Tall varieties that require staking should be grown behind smaller plants. 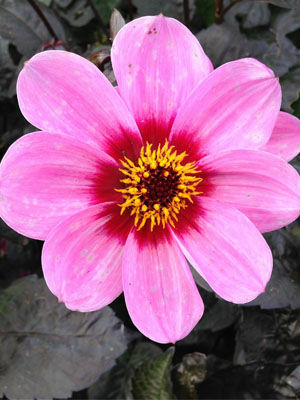 Dwarf dahlias can be mixed with Asiatic lilies or re-blooming roses. Dahlias are often sold as dormant crowns consisting of several connected tubers. Prepare a wide planting hole dug to at least 12 inches (30 cm) deep, and generously enrich the holes with rich compost and a balanced organic fertilizer. Spread out the tubers and plant them 3 inches (8 cm) deep. A few weeks later after the first stems emerge, hill up a little soil around the base of the plant and begin summer mulching. Allow 24in (60cm) between tall dahlias. Small dwarf varieties can be planted 12in (30cm) apart. Dahlias will bloom all summer when provided with regular water and fertilizer. The color range is endless, and flower size can be large or small, depending on variety. Dahlias make excellent cut flowers, so they should be easily accessible. Cut dahlias for arrangements as soon as the blossoms open, preferably in early morning. Immediately plunge the stems into warm water. As the flowers fade in the garden, trim them off with scissors or pruning shears. Numerous insects and diseases can plague dahlias. Promptly trim off badly damaged branches, and use insecticidal soap to manage thrips and whiteflies if necessary.